‘Nuff said. I had the incredible honor and pleasure of talking to Tom Lopez of ZBS about his days of audio collecting and producing, his latest efforts with short-form audio and the future of the form. 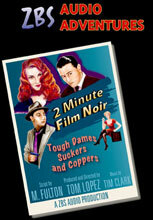 Plus a few nuggets of “2 Minute Film Noir” tossed in for flavor. It was nice to hear Lopez hasn’t given up on getting his audio dramas on the airwaves. Way back when, Ruby pioneered his idea of doing 3-minute doses of drama for magazine-style shows. I was still highly impressed that he was able to tell such entertaining self-contained stories in the two-minute noir segments you aired. Bill Raymond was just as amusing as ever. The recent month-long focus on ZBS really seemed like a feather in Radio Drama Revival’s cap. Congratulations in pulling it off so nicely, and thanks for all the hard work you’re doing to make this website click. Thanks for the comments! Yeah, Tom has some great stories and is a huge inspiration. After this interview I was really jazzed and it helped me get on track with the production “Waiting for a Window.” Hope to have some more ZBS on the show soon!